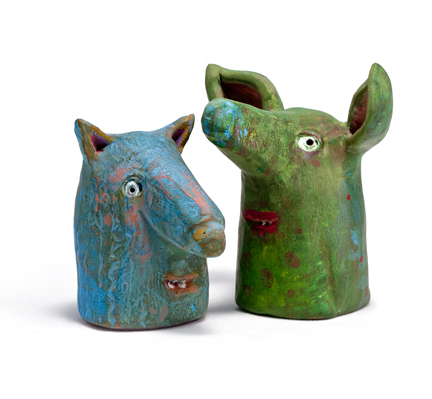 This week’s Art of the State Artist Interview is with ceramic sculptor Barbara Fiore. Her piece, A Reversal of Fate, was one of my husband’s favorites at the exhibition. You can find Barbara online at her website, her blog, and see this piece in person at the Art of the State: Pennsylvania 2013 at the State Museum in Harrisburg, PA through September 8th. I had always been a doodler and loved playing with various two dimensional media but never had much of a feel for 3 dimensional work until I participated in a local event and “painted” a black bear for the Milford Black Bear Film Festival. The bears are actually hunting forms and do not have a good surface for painting, not to mention that they are not a very attractive shape either. I had been working as a graphic designer and illustrator for years, so I looked at my bear from a design point of view. I didn’t think of it so much as sculpting as I did correcting and I started carving away at the foam where I thought it needed to be taken away and building him up where I thought he needed to have more. I finished the bear with glazes made from oil paint to look like it was carved out of a piece of pine. With polymer clay, I created a bird for his head and insects that I attached to his body and an old stump I mounted him on that I found in a neighbors field. After so many years of working on the computer, I loved the physicality of working on such a large project — everything from searching for the perfect stump to sculpting all the animals and insects and all the problem solving in between. After that experience, I took a few Continuing Education courses in ceramics at the School of Visual Arts. 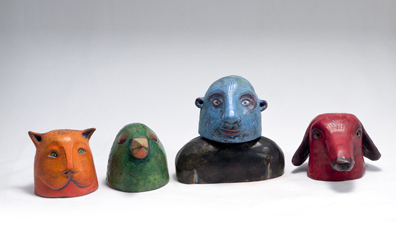 Ultimately, I discovered my love of hand-building with clay and specifically creating creatures. I’m always inspired by finger puppets of all sizes and interchangeable heads and the possibilities of creating relationships and stories with inanimate objects. I love creating animals and finding what is human in them and figuring out where is the animal in us. My first passion for sculpture was ignited by sculptor Tom Otterness. Years before I ever thought of sculpting anything, I used to visit his work in Battery Park City and then all around New York. It’s so playful and fun but still has a bit of a sinister undertone and complexity that keeps it interesting. I’m drawn to the narrative in his pieces and the play of the characters with each other — very exciting. Once I started playing with clay, I knew the direction I wanted to go but did not really know what was possible or what was out there. My first inspirations were Ann Roberts, Wesley Anderegg, Mark Chatterly and Tom Bartel. 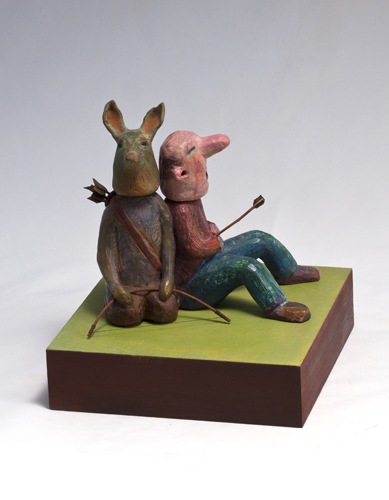 My absolute favorite ceramic sculptor is Kathy Rutenberg — love her work. And then there is the always inspiring…. Kiki Smith, Claude and Francois-Xavier Lalanne, Louise Bourgeois, Judy Fox, Peter Woytuk, Akio Takamori, Sergei Isupov, Debra Fritts, Gerit Grimm… I could go on and on. I recently sold a finger puppet online to a woman that I did not know. The finger puppets were listed as individual items, but over time two of them had become a pair. Around my studio, they always seemed to be cuddled next to each other. I meant to update the website to sell these two as a pair — Juniper and Jimmy — never to be separated. It was as if they needed each other. Jimmy more than Juniper. One day, I got an email that Juniper had been purchased and I felt so sad for Jimmy. I know they are just painted clay, but it still made me sad to think of them apart. What would he do without his Juniper? How would he cope? I didn’t know what to do. So I decided to surprise the buyer and pack Jimmy along with Juniper and send them on their way. The buyer was thrilled to find the stow away Jimmy in the box and she reports that Jimmy and Juniper are sitting happily together in her home. I am biased — I am part of a family of artists. 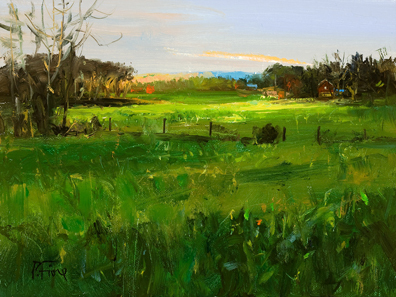 My husband is a landscape painter (peterfiore.com) and my stepchildren are artists as well (lisafiore.com and paulfiore.com). Our house is full of their work from over the years and it would be hard for me to single out any one piece. Many were gifts and each one is a treasure and triggers many memories. There is one in particular, I will tell you about. My husband was in a bad car accident in 2008. After a few months of recovery he began to paint a 6×8 inch landscape every day which he sold on the internet every morning for $100. He did this for 110 days and every one sold within the first few minutes of going online. It was a wonderful exercise for him to ease back into painting as well as being a steady revenue stream after the economy collapsed in 2007. It was a welcome reprise from what could have been a very difficult and depressing spring. The very last painting he decided to keep for himself and we hung it in our bedroom. Besides being a beautiful painting, it’s a reminder of triumph over pain and for me it is a constant reminder of a body of work that was created one day at a time. A simple idea that is easy to forget or never really understand when you are just beginning. It is easy to get caught up in the whole project or future career and forget that it’s all created one piece at a time. If you make one painting a day at the end of the month you will have 30 paintings. Wow! If you make two sculptures a month, at the end of the year you will have 24 pieces that you didn’t have otherwise. That seemed very doable and that inspired me to begin to create a body of work, one piece at a time.